Looking for a promo product that will stick around through the fall season? 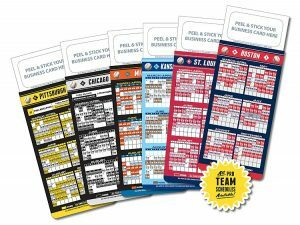 Baseball schedule business card magnet is avail in all pro teams. Schedule on the bottom area and a peel and stick area at the top to attach your business card. Great for offices with multiple sales team members. Min 100 at 50 cents ea, 300 or more 40 cents ea. Must be ordered in increments of 100.